Welcome to another Campaign Update, keeping you informed of our constant fight to make things better for bunnies. As if Richard Saunders was not already fantastic enough, he has added another qualification to his name. He now has the European College of Zoological Medicine, Diploma Specialist in Zoo Health Management to add to his accolades. This gives him more letters after his name, and he is now on the Scientific Committee for EBVS. Richard has recorded a webinar with HIPRA, who are the manufacturer of Eravac, on the ever-popular subject of RVHD2. As soon as it is available we will share the link to it on social media, so keep your eyes peeled. 1st June– Non clinical day (owners, rescue workers) in Birmingham. 1st June– Clinical͚Rabbit Essentials͛ day, in Birmingham. This is for vets and vet nurses. It is lecture based and will cover subjects that we think are essential for every small animal practice. 22nd June– Advanced Rabbit Practice, at The Royal Veterinary College, Hawkshead. Lecture based, but covering more advanced rabbit care and investigation using the fantastic team at the RVC. 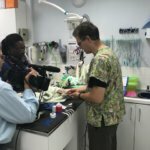 23rd June– Rabbit Interactive Roadshow – 2 x 3-hour workshops covering dentistry and airway management, also at the RVC, with the fabulous Craig Hunt. Small group so be sure to book early. 1st December– Rabbit Interactive Roadshow – 2 x 3-hour workshops covering dentistry and airway management, in Newcastle Upon Tyne, using the awesome Kevin Eatwell. Small group so book early to grab a place. Full details will follow shortly. Please keep an eye on our website, and social media, or sign up to our First Alert service. You will be able to book via our shop website shortly. Despite the amount of work and debate that Brexit has generated, there is still some progress with animal welfare legislation. There have been consultations for the UK for animal sentience and for Scotland with regards to breeding and licencing. This is obviously an area we are very keen on, given our Capone Campaign work, and something we can respond to with a lot of confidence. There have also been consultations on licencing of pet shops, riding schools etc., and on the 1st October 2018 the English government launched new regulations for the sale of puppies in the UK. This is great news, and we will be looking into the possibility of this legislation applying to rabbits also. BBC Radio Shropshire phoned the helpline in October after an on air discussion between listeners who were discussing keeping rabbits and guinea pigs together, which caused some contention. We were invited on the next day to put the record straight, which is exactly what Richard did! We are often asked about keeping rabbits and guinea pigs together. This is not advisable for the following reasons: ͞Bordetella bronchiseptica is a bacterial infection of the upper respiratory tract of a number of species, including dogs, rabbits and guinea pigs, related to B pertussis, which causes whooping cough in humans. It is often described as commensal in rabbits (i.e. found in this species without causing harm), however, it can be a primary disease-causing organism, and can complicate other infections such as Pasteurella. It can, though, be fatal in guinea pigs, and so keeping them in the same airspace as rabbits is not advised. The main reason these species used to be kept together was for companionship without the risk of pregnancy. With improvements in anaesthetic safety and more widespread neutering of both species, this is less of a problem now. Whilst we would not recommend putting them together in the first place in this day and age, we would not advocate splitting up a stable sole rabbit:sole guinea pig pairing͟. We are still hearing of owners who do not know about RVHD2 and the need for a second vaccine. Feedback suggested that our vaccination poster did not get the message across so we have a new vaccination poster which we hope will be more effective. If you are on social media please share. You can find it on our own social media pages and website. Just to clarify, this is our advice on vaccinations: ͞You will need to give your rabbits two vaccines every year to protect them. The most common are Nobivac (protects against myxomatosis and RVHD1) and Filavac (protects against RVHD1&2), or Eravac (protects against RVHD2)͟. Myxomatosis (covered by the vaccine Nobivac Myxo-RHD); Rabbit Viral Haemorrhagic Disease 1 (covered by Nobivac Myxo-RHD), and Rabbit Viral Haemorrhagic Disease 2 (covered by the vaccines Filavac KC and V, or Eravac). If anyone has documentary evidence of any exotic diseases arriving in the UK in future please inform us and the Animal and Plant Health Agency (APHA)͟. 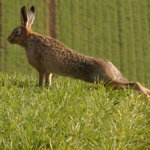 Just as we were going to press there was an article in the news about a hare being diagnosed with myxomatosis in the UK. Here at the RWAF we have been asked, over the past week or so, about myxomatosis in native wild brown hares in the UK. It’s important to be aware that this information is subject to change as the investigating continues, but is correct at time of posting. Sporadic cases have been reported in the past, of suspected or confirmed myxomatosis in hares, including one which was written up in the veterinary press in 2014. However, this appears to be different in that multiple cases, from a wide geographical spread, are being reported to Dr Diana Bell, University of East Anglia and, whilst some have obvious external symptoms of myxomatosis, other dead hares look fine/in good condition or are seen dying with unusual neurological symptoms including an inability to move and seizures. A number of possible causes are being explored, including a change in virulence of myxomatosis virus, infection with Rabbit Viral Haemorrhagic Disease 2 (RVHD2), or European Brown Hare Syndrome, individually or as co-infections, and it’s possible that other factors are involved. What would really help the ongoing study into the large scale deaths of this iconic species would be for any members of the public finding a dead or ill hare to contact Dr Bell on: d.bell@uea.ac.uk. Please try and keep the body refrigerated whilst contacting Diana to arrange for a full post-mortem analysis. for us. 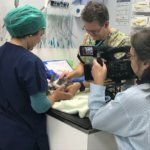 We hope to have a lot of content for vets and owners in 2019. Again, watch this space for an update. We are excited to announce the newest member of the RWAF Team – please welcome baby Eden. Emma (Boyd) gave birth to gorgeous little Eden on 15th September. It will be no surprise to read that Eden is already a rabbit fan and has a good collection of rabbit themed clothes and toys. Emma is on maternity leave until the New Year but she will soon be back in the swing of things and working alongside Rae to organise the CPD for 2019. If Eden is anything like her amazing mum then animal welfare is going to have a fantastic new advocate.